When we’re working together to develop a beautiful, comprehensive web site that represents your business with class, efficiency, and style, we have the capability to also create an appealing splash page as a temporary placeholder for your web address. 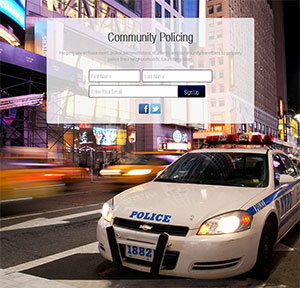 Community Policing resource and social platform for police officers, law enforcement, students, educators and community leaders. 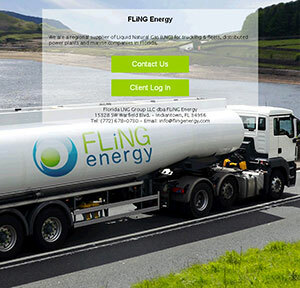 Liquid Natural Gas transportation services and green energy solution provider. You may be wondering: what’s a splash page? In short, it’s an attractive, informative, branded page that greets the users who surf to your URL until your full web site is ready to go live. In addition, a well-thought splash page can be used to collect newsletter signups and direct users to your social media profiles where you may further engage them. At Consorte Marketing, part of putting together a complete and successful web site includes effective splash page design. We want potential customers to know that something big and exciting is coming … and that’s you! Is using a splash page good or bad? Can it really make a difference in your conversions later on? Think about it this way: if you were sent on a detour while driving to work, and you passed an empty storefront, which would be more effective in capturing your attention and interest: a black-and-white sign that read “UNDER CONSTRUCTION” in a generic font, or a bold, aesthetically pleasing poster announcing the opening of a new restaurant, shop, or spa, complete with an opening date and the company’s web address? The unimaginative, uninformative sign wouldn’t make much of an impression at all, but the attractive, explanatory one would pique your curiosity. You might even be tempted to take the “scenic route” to work again a few weeks later to check on the store’s progress. Splash page advertising is essentially the online equivalent of hanging an eye-catching and helpful sign in your window. If you have questions about splash page effectiveness, think about the last time you landed on an ugly and generic “This domain name has been registered” page. It probably told you absolutely nothing of value, like the site’s launch date or a brief summary of the company who purchased the URL. All-purpose landing pages like that are pretty forgettable—who’s really going to bookmark that in hopes of seeing something more exciting in two weeks? On the other hand, if you greet customers with a page that incorporates design elements (unique color palettes, fonts, photos or graphics, etc.) from your up-and-coming site and include some information about your brand, as well as methods of contacting you and a full launch date, they’re far more likely to make a note to return and learn more. Your web design partners at Consorte Marketing will employ splash page best practices to give users a sneak preview of the first-class products and/or services you have to offer. We’ll help you to make an amazing first impression with a page that represents your excellent business and dedication to customer service. We don’t just create a generic splash page template; we put thought into the perfect background image and other graphics, plus integrate it with an email platform and include links to your Facebook, Twitter or other social media profiles using a simple yet effective layout. We’ll start building the buzz around your business even before your web site goes live. And we’ll design responsively so that millions of mobile users get your message, too. From the very beginning, you and your brand will make, well, a splash.